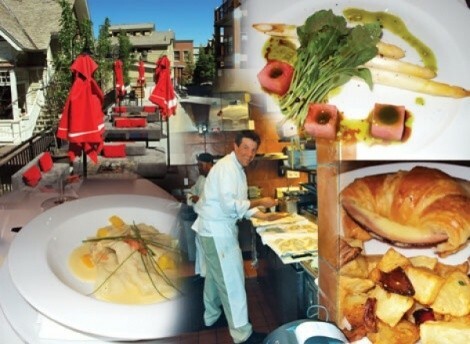 Sky's the Limit: It's summer in Park City at Sky Lodge's restaurants and bars. Despite an ongoing reorganization under Chapter 11 protection, Park City’s Sky Lodge Condominium Hotel and its restaurants and bars have kicked things up a notch this summer and appear to be making a very strong comeback from financial turbulence. In particular, Bill Shoaf, who oversees the operation of Sky Lodge, has created a ski-town playground for those who enjoy dining, drinking and the sort of lazy lounging and lingering that Sky Lodge encourages. Gone, unfortunately, is the Easy Street Bakery, which I dearly loved. But, in its place the Sky Lodge has opened the new Amatsu Japanese-inspired spa and a sun-drenched “backyard,” equipped with a bocce ball and horseshoe court, outdoor sofas, patio umbrellas and tables with built-in fireplaces. The backyard leads conveniently to Sky Lodge’s Le Bar Boheme, which sports a self-serve Bloody Mary bar on weekends, live piano jazz during ski season and is a wonderful place anytime for a cocktail and a bite from the bar. In addition, the fourth-floor private club at Sky Lodge is now open to the public as Sky Blue—appropriately named, given the Tiffany blue-colored splashes throughout the swanky bar, which opens up to a large, comfy, radiant-heated deck overlooking Old Town and complete with chaise lounges, fire pit and an oversize hot tub for splashing whilst sipping. And I thought you had to go to Vegas for this kind of adult entertainment! It’s no wonder the Robb Report named Sky Lodge “Best of the Best” for luxury hotels. Easy Street Steak & Seafood still anchors the culinary end of the Sky Lodge, with talented chef Scott Boberek at the helm. The restaurant, which also services the downstairs Bar Boheme features brasserie classics such as hanger steak frites ($25), a charcuterie plate ($12), chilled seafood platters ($33-$52) and roasted rosemary chicken ($17) cooked on Easy Street’s in-house rotisserie. In addition, there are daily specials, including Wednesday’s family-style dinner for two or more ($22 each), which features the rotisserie meat, chicken or fish of the day, roasted potatoes, veggies and a platter or profiteroles with chocolate. On Saturdays, it’s hard to beat the rotisserie-cooked prime rib ($22). And, at Easy Street, there’s really not a bad seat in the house, or, for that matter, outside the house. Right now, it’s hard to beat a sunny table on the Easy Street patio or downstairs outside Le Bar Boheme. But dining inside, too, is very inviting; with the restaurant’s classic French brasserie décor and bustling atmosphere, you might just think you’ve landed on the Left Bank. Overall, the vibe is at once polished, professional and still very friendly and easy-going. Hence, perhaps the name: Easy Street. A bowl of sautéed mussels with fresh herbs and white wine tomato broth, accompanied by grilled, rustic baguette slices ($15/$25) is a perfect summer starter at Easy Street. I also highly recommend the thin-shaved buffalo carpaccio ($12), dressed lightly and simply with arugula, shaved Parmesan, lemon oil and tangy capers. For anyone longing for the tart-like pizzas of Southern France and Alsace, called pissaladiere, I suggest Boberek’s tarte flambée, in particular the grilled eggplant, chevre and capers tart ($10). A crisp glass of Chablis would be ideal to sip alongside. Since Easy Street serves breakfast/brunch, lunch and dinner daily, Boberek’s culinary skills, by necessity, are wide-ranging. Surprisingly, I enjoyed the best huevos rancheros ($13) I’ve ever tasted at Easy Street, made extra-special with shredded beef from slow-cooked short ribs, along with black beans, fresh cotija cheese, pico de gallo, warm tortillas and two beautifully runny fried eggs on top. OK, so maybe Boberek didn’t cook my huevos; I suspect there’s a Mexican chef or two in the kitchen. But, at the other end of the dining spectrum, he did cook an incredible dish of homemade lobster-stuffed agnolotti pasta pillows in a rich sauce made with Beehive Butter Bound cheese, which was gorgeous when paired with Beringer’s “Private Reserve” Chardonnay, Napa Valley ’07. A simpler summer dish was a delightful course of smoked white asparagus with chilled green tea vinaigrette, arugula leaves and delicate watermelon cubes. The slight smokiness of the asparagus created an interesting contrast to the sweet, ripe melon. And, paired with Chateau St. Jean “La Petite Etoile” Fume Blanc ’07, this dish was a killer. Yet another winner is a dish that Boberek does for certain special occasions, but which I hope finds its way to Easy Street’s regular menu: duck cassoulet, in which the chef incorporates duck confit, duck sausage and duck breast into a mélange of white beans, roasted garlic and escarole. Enjoy this one with a bottle of Etude Rose of Pinot Noir ’07. Other Easy Street highlights during recent visits included a breakfast ham and Gruyere croissant with crisp pommes roti ($8), criminally subversive bananas Foster French toast ($10), classic eggs Benedict ($12) and, for lunch, the “VLT”, a vegetarian-friendly take on a BLT sandwich, with grilled vegetables, buffalo mozzarella, sprouts and artichoke sun-dried tomato aioli on wholesome, wheat ciabatta bread ($8). Since Sky Lodge’s boutique Euro-hotel seems to encourage decadence and excess, you might want to be careful about imbibing too much in the bars or restaurants, lest you find yourself getting too tipsy and putting a down payment on one of the 33 residences there—which range from $259,000 for a two-bedroom condo to a three-bedroom penthouse starting at a million smackeroos. Remember though, for much less, you can always just get a room for the night, be pampered like royalty, and wake up to the smell of applewood-smoked bacon and house-made country sausage wafting up from Easy Street.